This loop hike explores Fish Canyon and an unnamed canyon to the southeast. It follows a trail used for an annual horseback riding event down into Panamint Valley. The mouth of Fish Canyon is reached by hiking a little over a mile along the base of the Panamint Valley side of the Slate Range. 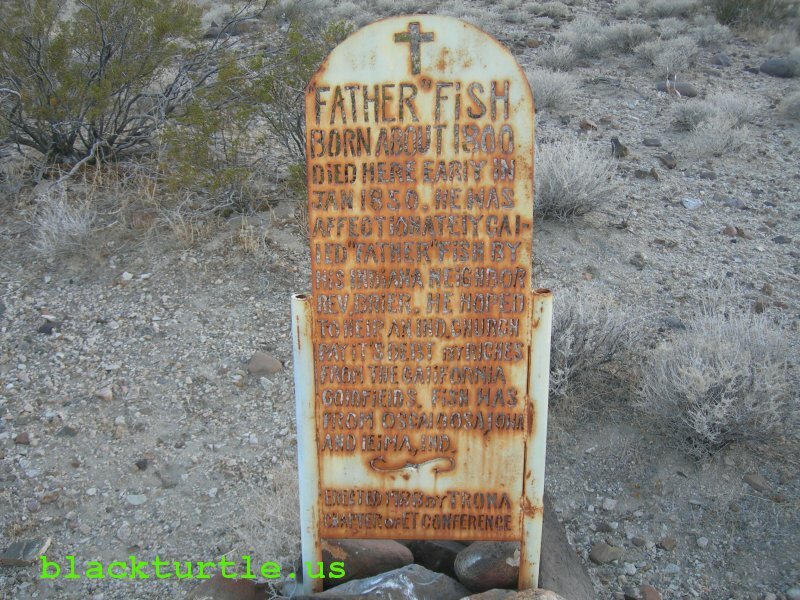 Interesting historical markers are found in Fish Canyon which provide information about Father Fish, the Bennett-Arcane Party, and other matters of historical interest. TRAILHEAD: Drive 3.6 miles north from the Inyo County line marker on Trona Road (Highway 178) and turn right (east) onto P68 at the "Valley Sand and Gravel" sign. Follow P68 for approximately 5.6 miles to the intersection with the road which travels through Isham Canyon and over Manly Pass (P67). This intersection is not marked, so set the odometer when leaving the highway. Along the way from the highway to the trailhead P68 veers left at 1.9 miles (just before the sand and gravel plant) and passes by roads which go off to the right at 3.4 and 3.6 miles. There is also a steep hill to climb over along the way which will probably be best negotiated in four-wheel drive. High clearence is required most of the way to the trailhead. HIKE DIRECTIONS: From the trailhead hike north on P68 approximately 0.3 miles. Find a trail on the right side of the road which drops steeply into a wash. Follow this trail all the way down to Panamint Valley. This trail drops about 1600 feet in about 3.7 miles. There is one side trail to be bypassed and the trail has a few ups and downs, as well as a few sudden changes in direction along the way. (This trail is outlined in yellow on the accompanying map.) At about 4 miles from the trailhead leave the trail and turn northwest and hike about 1.4 miles to the mouth of Fish Canyon. Here you will find a road (P168) which you can follow for about a mile. 1. Fish Canyon - The alternative trailhead is Fish Canyon. It can be reached from Searles Valley by continuing on P68 until Fish Canyon is reached. It can also be reached from Panamint Valley. Consult a map for two different ways of getting to Fish Canyon from Panamint Valley. In any case, the hike may be started from the mouth of Fish Canyon or anywhere along the road up to the P168 marker. 2. Two Monuments - Two historical markers are located here. This is a good place to explore around a bit. Behind the markers is a dry fall. It is worth the effort to hike around to the top of the falls. Just continue up the southwest fork of the canyon about 200 yards from the markers and then hike over the ridge to the southeast and then follow the wash down to the top of the dry falls. BTW, another similar monument is located at the top of Pleasant Canyon in the Panamint Range. 3. Windrows of Sand - Hike to the northwest from the two monuments up the southwest fork of Fish Canyon and find another marker at the top of a barren hill. There should be trail markers along the way. 4. Direct Route - This is the preferred route back towards the trailhead (marked in blue). The route recorded on the GPS is a little longer and less direct. The route marked in red continues to the top of the northwest fork of Fish Canyon and then follows the ridge back around to the southeast fork of the canyon before continuing up a side canyon to the trailhead. 5. P68/P168 - This is the approximate route of the road between Fish Canyon and the trailhead. Somewhere along the way the designation seems to change from P68 to P168, although it is unclear as to where this change occurs. 6. Horse Trail - It would be interesting to learn more about the history of this route. At present it is used by a horse group once a year, usually late in December. There is one side trail worth exploring. Also continuing down the wash about a mile down this trail will take you directly to Fish Canyon, thus making several loop variations possible.